They Might Be Giants: Still 'Emotionally Arrested' At 50 For John Flansburgh and John Linnell, being in a band at 50 is no different than when they started. They Might Be Giants' members have been making quirky, smart — some say geeky — pop songs since the early '80s. They found early success with songs like "Birdhouse in Your Soul" and a cover of the novelty tune "Istanbul (Not Constantinople)." More recently, the group has been writing children's songs. "The kids stuff really took us by surprise," John Flansburgh says in an interview with All Things Considered host Robert Siegel. "We did a kids album as a one-off, and it was just met with so much positivity from critics and real-life families that it launched us into a second career, sort of parallel career. It came perilously close to taking over our career a couple years ago, and now we've come back to this." 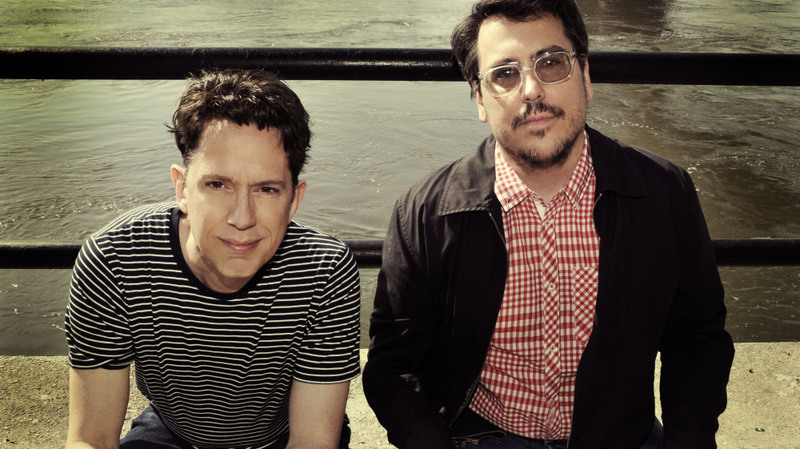 The two men who are They Might Be Giants — Flansburgh and John Linnell — are now both in their 50s, and they've returned to writing songs for grown-ups on a new album called Join Us. The differences here, of course, lie in the themes. "I think that we wanna talk about things that are hard to talk about," Linnell says. "Music is a great way to open that door. You know, we really grew up in the heyday of experimental popular music [in the] late '60s and early '70s. Those songs are kind of the role models for what we think pop music can be, and if you want to bring an experimental sensibility to a three-minute-long song, you don't have to reference 'Strawberry Fields Forever.' You can make up your own very-hard-to-understand music." Flansburgh says that "Three Might Be Duende" is like the Three Musketeers with vocabulary words. "Duende is a delightful word that I think, in at least one definition of it, the first part of the definition is: It's hard to define," Flansburgh says, laughing. Wikipedia defines "duende" as a "difficult-to-define word used in the Spanish arts, including performing arts. From the original meaning (a fairy- or goblin-like creature in Spanish and Latin American mythology), the artistic and especially musical term was derived." "It really means the spirit of art, but in the sense of the passion inside — artistic expression," Flansburgh says. That's not the only word that sent Robert Siegel to the dictionary. The song "Cloisonné" was inspired by a project Flansburgh and Linnell did in high-school art class. It's a process where you melt glass dust in a kiln to create jewelry "that you give to your mother." For Linnell and Flansburgh, doing They Might Be Giants at 50 is no different than it was when they started. "Maybe we're emotionally arrested people, but we apply pretty much the same spirit now that we did 25 years ago," Linnell says. "I don't think that we've dramatically changed our philosophy about it." "A few years ago, somebody said that [his] philosophy is, 'If it's not happening, it's not happening,' " Flansburgh says. "In other words, when your head hits the pillow, don't worry about what you have to do tomorrow, because it's not going to prepare you any better. Just be in the moment and be present, and things will go your way. I take tremendous solace in that, actually."